Each Box contains Six Autographs, Two Gem Cards, and Two Memorabilia Cards! 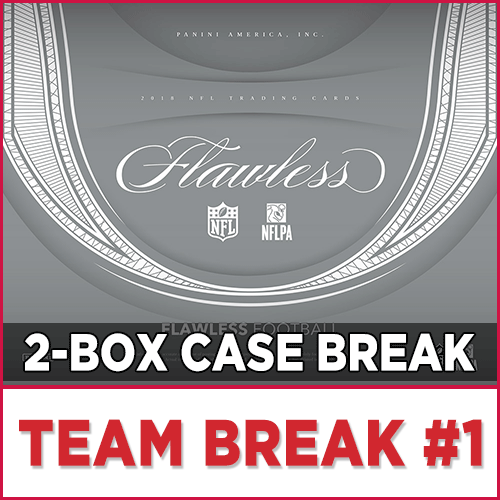 All cards in Flawless are #'d/25 or less, all autographs are on-card or cut autographs. 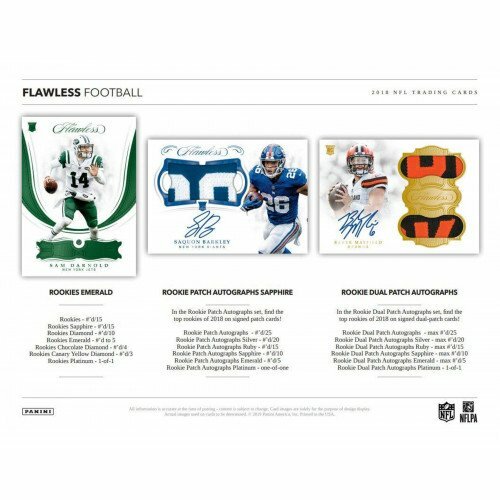 2018 Flawless features more patch autographs and one-of-ones than ever before! New autographs sets for 2018: Laundry Tag Signatures, Rookie Dual Patch Autographs, Flawless Draft Gems, Super Bowl MVPs, Captain, Rookie Booklets, Veteran Booklets, Signature Gems, Flawless Duals and Super Bowl Gems! New gems for 2018: MVPs, Bears, Broncos, Giants, Eagles and Chiefs! Look for that all new booklet autographs! 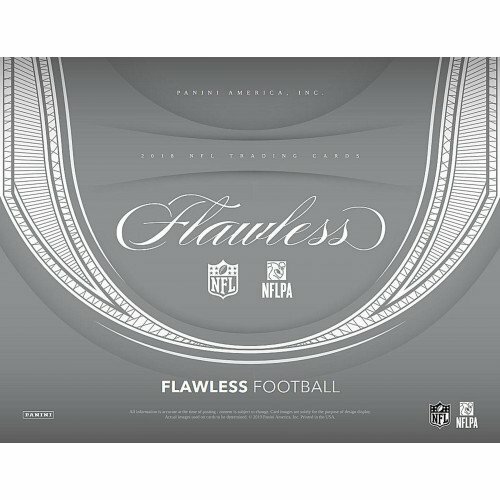 Rookie Booklets, Veteran Booklets, Signature Gems, Flawless Duals and Super Bowl Gems all feature on-card autographs! Autographs for 2018 include Tom Brady, Aaron Rodgers, Joe Montana, Drew Brees, Jared Goff, Carson Wentz, John Elway, Dan Marino, Jerry Rice, Patrick Mahomes II and the rest of the NFL's best! Also look for cut autographs of Walter Payton, Derrick Thomas, Reggie White, Johnny Unitas, Pat Tillman, Sean Taylor, Bart Starr and more! SUPER BOWL GEMS PLATINUM: Featuring the Super Bowl logo embedded with diamonds on one side and either Tom Brady or Aaron Rodgers on the other, these cards are truly one-of-ones! 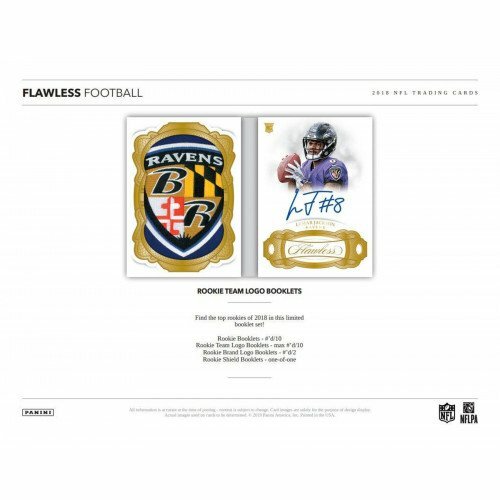 ROOKIE TEAM LOGO BOOKLETS: Find the top rookies of 2018 in this limited booklet set! CAREER PROGRESSIONS: Showing Career Progressions of the games best, these cards really stand out! 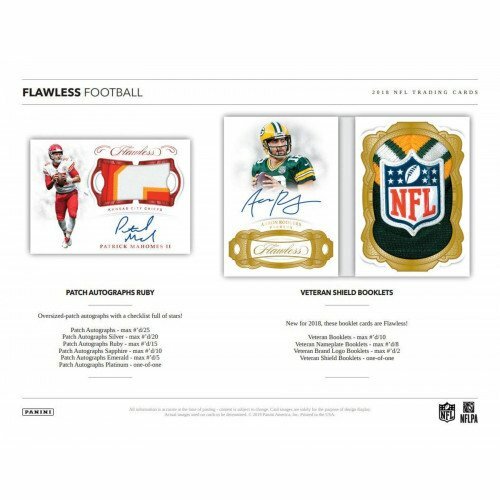 STAR SWATCH SIGNATURES PLATINUM: Full of names like Carson Wentz, Antonio Brown, Patrick Mahomes II, Drew Brees, Jared Goff and J.J. Watt this set is star studded!